The flowering dogwood grows throughout the United States. The flowers, which are generally white but can also be pink or red, bloom in early spring. A full-grown dogwood averages 20 to 30 feet in height and width. It's a beautiful tree, with dark green leaves that turn red in the fall, red berries and hard, heavy bark. If the bark is stripped, however, it leaves the tree vulnerable to insect infestation and disease. It's important to treat your tree promptly if the bark is stripped or nicked. 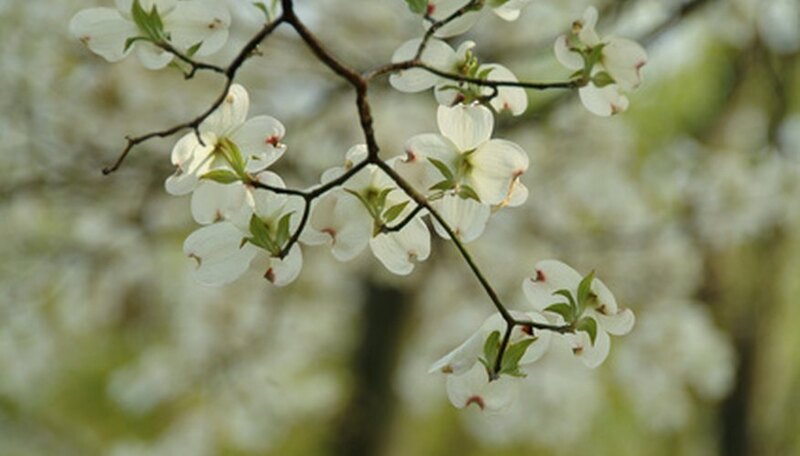 Inspect your flowering dogwood tree carefully in the spring, looking for spots where the bark is nicked or stripped off. If you see any trouble spots, treat them promptly to avoid insect infestation. Use a sharp knife to cut off any damaged bark. Carefully remove any scraps of bark with your fingers. Cut the bark around the exposed area into an elliptical shape–long and narrow. Generously pour denatured alcohol onto a clean cloth. Denatured alcohol is a mild solvent available at paint and hardware stores. Wipe the exposed area thoroughly to clean and disinfect. With a clean paintbrush, apply tree paint or shellac. Keep an eye on your tree; if you notice decay in the open area, you will need to treat it again. When winter approaches, wrap your dogwood tree so the area with exposed bark is protected. Start below the area you aim to protect and wind the wrap around the tree tightly. Cut the wrap and tuck the end in. When a dogwood tree's bark is stripped or nicked, there is an opening for insect infestation, especially the dogwood borer. Signs of infestation include dying leaves, holes in the trunk and dying branches. You might want to spray your tree with an insecticide such as chlorpyrifos to prevent the borers from getting a foothold. Consult your local nursery for their recommendations for your area. Prevention is the best answer. Avoid the problem by taking care when pruning your tree and mowing the lawn so you don't damage the bark.